Is pride worth your son dying for? Even if his brother has done him wrong in the past. Isn’t it best to accept his life and give his son who he loves the chance of life? We learn that the reason behind all the bad blood is between the brothers is because of the fact that Ethelbert’s mother married a second wife which was Thaddeus’ mother. He said that as soon as Thaddeus’ mother came into the picture his father turned against him and mistreated him because he now hated his mother and as a result a family rift began. I never hear cheerful stories of polygamy. There is always bad feeling, jealousy and feelings of mistreatment. What are your own feelings about polygamy? Are you from a polygamous family? Do you know anyone from a polygamous family? What have been your observations? Do you think that there is a place for polygamy is today’s society? I loved the way that music was used in the movie. It was very effective in creating and dissipating tension. There was a grreat build up of tension in the early scene where the door of the family home is being banged on in the middle of the night. This is heighted by the music. Great juxtaposition between the fear and terror experienced by those in the house and those outside the house, both are experiencing a fear as profound but for different reasons. I would recommend this movie. Good solid actors were cast with good performances. The storyline was good and brought up relevant issues. The story did go off on a tangent at a point and I couldn’t necessarily see how it tied in to the main storyline, however there is a continuation called A Better Tomorrow that I saw in the previews so I will reserve any further judgement until I see that. 1. I liked the story the movie told. When I saw that the story/screenplay was by Emma Ikenna Aniekwe, I knew the story was going to be good. I particularly liked how the "Jos riots" bit was incorporated into the plot and how it served as the background for the narrative. 2. I liked the cast. 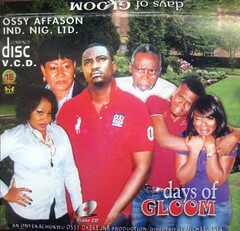 With a cast that has Olu Jacobs, Ngozi Ezeonu, Chioma Chukwuka, John Dumelo, Ken Erics and Adaora Ukoh, one can't go wrong. Also, the actor that portrayed the brother to Olu Jacob's character did a good job (as did the actors that played his wife and kids). 1. I must have missed a scene were this was addressed. Was Ngozi Ezeonu's school supposed to be in the village or the city? It looked like it was in the village because she went to see her office right after they arrived at the village. Also in a scene (after she saw her office), her kids had a conversation and it seemed they were still in the village. I too enjoyed that family meeting scene because it was just as I imagine it would happen in real life.